The wireless ability to manage pumps remotely over long distances is now available using Omniflex’s Teleterm M3 Radio RTUs. 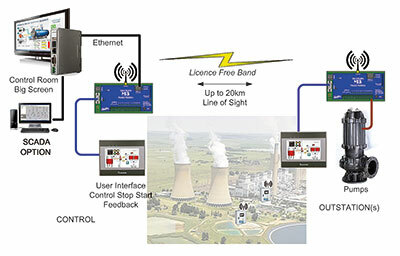 This full functionality IEC61131 PLC enables both control and wireless communications to exist in a single package with flexible I/O and subnet communication interfaces for VSDs and other serial devices including power meters. The system comprises as many Teleterm M3 Radio RTUs as required, each housed in a weatherproof enclosure with a built-in PSU and standby batteries. A unit is installed at the (local) remote control side with all the I/O dedicated to control inputs and pump feedback statuses, while at the field side at the pump (remote) a unit with all the I/O dedicated to control outputs and pump feedback inputs is installed. Power station water plant data acquisition and control. The built-in radio allows up to 20 km line-of-sight communication between the two sets of controls, allowing flexibility. The system supports peer to peer communications allowing multiple stations to be integrated into one control system. This allows easy plug-and-play with only the wiring of the power supply and the control circuits required. Optional HMIs can be provided to do the control of the pump and to indicate statuses. The on-board Ethernet port also allows connection to an existing scada or DCS system, thus saving on additional hardware. Big screen options are also available to visualise the entire water plant in real time for a control room, ensuring operators are not blind to outside plant statuses. A communications link indication is provided to ensure the system is up and running, while alarm logging can be included so that status can be recorded for historical purposes. Even the speed of the pump can be controlled, as the unit includes both a 4-20 mA input and a 4-20 mA output. Low power consumption makes the system suitable for use in a solar powered environment if required, and a battery can be included in the event of a mains power failure. Water quality as part of environmental responsibility is a key element to triple bottom line reporting with water licensee operators needing to provide data for licensing authorities and compliance data for reporting.